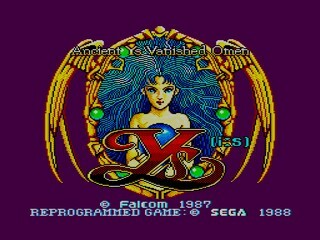 Released on June 1987, Ys I was the first in a long series of games that can easily be misspelled as Y's because of the way the logo looks. Adol Christin arrives at the town of Minea and is informed by a fortuneteller that evil is sweeping the land. He must find the six books of Ys that will give him the knowledge to defeat evil. Best time with Uber-Large-skip glitches: Single-segment 0:00:16 by Rasmus 'KrazyRasmus' Olsen on 2014-09-11. In this run I utilize the Pum's Pawn Shop Mirror Glitch to skip right to the credits of the game. Basicly what I do, is to scroll the screen to set them to a certain value, from where I enter the store and buy (and continue to try to buy) the magic mirror. This alters a couple of memory addresses, which sends me to the credits when I leave the store.